I recently asked #twitterblades to vote for their favourite three games of recent times. In response I received a tweet on twitlonger from Blades fan Tristan Woods-Scawen (@mrwoodpigeon) explaining his choice. His well chosen words resonated strongly with me and with his permission I have reproduced his words here. Hopefully they will strike the same chord with a wider audience. Football is a bond that unites us all and many of us will recognise elements of Tristan's story. You can choose your friends, but you can’t choose your family. It could be said the same for your football team too. Like many other boys growing up, I was “given” my team by my dad. 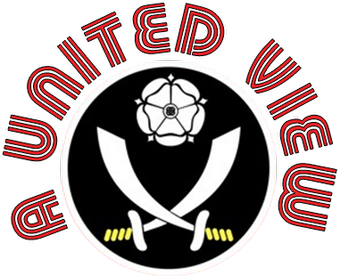 Although I have never lived in or even near Sheffield, it was The Blades for me. My dad went to Sheffield University in the early 1960s and having spent his formative years living down south and going to see Aldershot Town play, it was time for a step up in quality and with recent promotion to the First Division, it was BDTBL that he headed and it was an affair that was going to last the rest of his life. I was born in December 1978, not the best year to have been born a Blade with the team being relegated to Division 3 at the end of that season. By this time my dad had moved with us to live in Essex – not really known to be a hotbed of blades fans. With work and family taking over his weekends, it was more difficult to get to any matches, but the passion remained and I remember Saturday afternoons in the 80s say with my dad watching Teletext refreshing and the occasional celebration. We moved house again with his work and found ourselves very much in the heart of Coventry City supporters. As 1987 came and the infamous Coventry FA Cup win happened, I confided in my dad that I thought I wanted to go to Highfield Road as all my friends did and asked if he would take me. You should know that my dad was someone who always said he didn’t really like football unless it was The Blades playing. He was never one to sit down on Sunday to watch West Brom v Blackburn or some equally “non-match” as he would describe them. He had no real interest in going to see Coventry City, but he took me along. We watched a season together at Highfield Road, but before every game he always whispered to me at kick off that next season he would take me to see some “proper football”. I knew what this meant and whilst Sheffield was basically a foreign country to me, I was excited. So from my first trip with my dad to BDTBL (Beautiful Down Town Bramall Lane for non-United fans) in 1990, I was hooked. My parents had split up in the early 80s and I hadn’t lived with my dad for years, but doing the weekly 3-hour round trip to Sheffield or travelling to the countless away games was our time together and I’ll never forget it. The game that stood out for me is the FA Cup Quarter Final against Coventry. As well as having everything a game could have, we were going home to friends and family who were Sky Blues fans. It meant more to us than most I think and at the final whistle we just uncontrollably jumped and hugged. I couldn't wait to get home and rub it in with my Sky Blue mates. If you are reading this, I’m pretty sure you know that life as a Blade is never dull. There has been some success over the last 25 years, but mostly it’s a catalogue of disappointments of missing out on promotion, relegation, selling the best players and penny-pinching chairmen. I always read people complaining and they usually have a point, but this is why our club is the greatest club there is. We have had some amazing times at BTDTL (the greatest are usually evening matches it seems to me) and there is always something newsworthy happening at the club. Football with Sheffield United FC is the best soap opera you’ll ever see, the greatest movie plot you’ll ever hear and like the Hollywood greats, it’ll make you laugh and make you cry. My dad was unexpectedly diagnosed with a brain tumour in 2011 and I didn’t know it at the time but we had been to our last match together. After some pretty heavy treatment, he lost much of his speech and it was tough to make conversation. But through the last few months, we talked so much about the matches we had seen and what was happening that season. We knew he was coming to the end and so was the 2011-2012 season. Ched was gone, but I thought we could still hang on to the automatic promotion place. I thought that would be a great season for us to finish on if we could get that promotion spot. Nothing is ever straightforward with the Blades though and of course we had to go through the pain of the play offs. I sat with my dad watching the TV as the 432 penalties (or something like that) were taken at Wembley in the final. As Simmo missed his penalty and the game was lost, he just raised his eyebrows and shook his head. He passed away 12 days later. He was 65 years old. Somehow, we both knew the season had summed up what it was to be a Blade and that the last match he ever saw was strangely appropriate. We moan about this club of ours, but a football club will give us much more than we ever realise. It pulls people together; it creates great moments to share and memories to treasure forever. EPPP - If it ain't broke don't break it!